The Kershaw Pub is a compact multi tool designed by Dmitry Sinkevich. 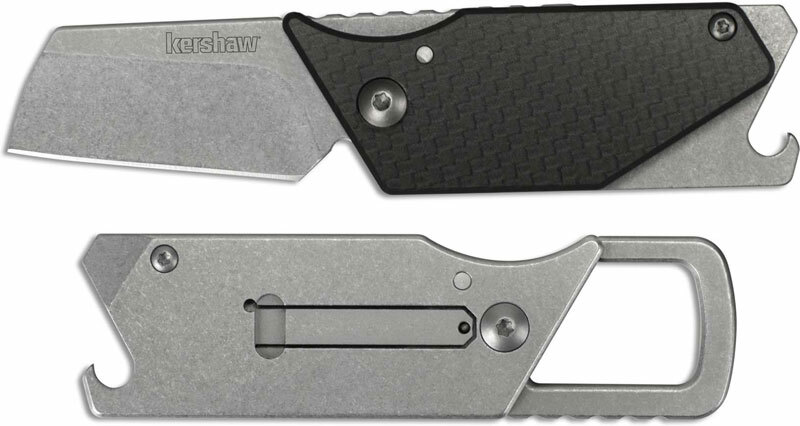 This Kershaw Pub Knife features a 1.6" non locking modified sheepfoot blade made of 8Cr13MoV stainless steel with a stonewash finish and a notched thumb rest for secure grip. The stainless steel handle has an integral bottle opener and screwdriver / pry bar, a black carbon fiber front scale, a strong detent to hold the blade in the closed position, and a large key ring attachment. (To open the knife, push down on the notched area of the key ring attachment.) The Kershaw Pub Knife with carbon fiber handle scale has a closed length of 3.1", an overall open length of 4.5", and it weighs 1.8 ounces. This knife is a great edc. It carries on a belt loop easily and discretely thanks to its clip. The blade is perfectly sized to accomplish almost small cutting tasks, and the bottle opener is a convenient addition. I carry this blade more than another knife. It's always with me and has received more usage than most of my other knives. The carbon fiber scale adds a touch of modern class. Can't recommend this blade enough. Great design great execution.